No matter where you choose to stay in Malaysia, you're surrounded by the contrasts of the city's rich culture and heritage against the backdrop of the modern skyscrapers and cosmopolitan atmosphere. 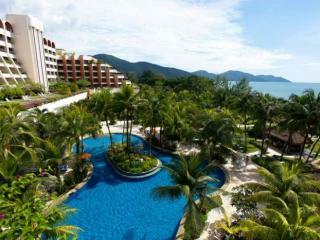 Throughout Peninsula Malaysia luxury resorts, boutique hotels, family friendly resorts and affordable accommodation options are surrounded by vibrant bazaars, cultural villages, Anglo-Malay architecture, historical attractions, towering skyscrapers, traditional longhouses, ancient rainforests and more. Kuala Lumpur is a vibrant, bustling cosmopolitan city offering a wide range of modern accommodation options. There are a fantastic range of international luxury hotels as well as an increasing range of boutique hotels and excellent affordable options which don't sacrifice on facilities or quality. All accommodation is conveniently located in the heart of the city just a short distance to popular local attractions. Langkawi is tropical island holiday destination home to a breathtaking natural environment featuring pristine beaches, lush mountainous terrain, fertile valleys and peaceful woodlands as well as rich fringing coral reefs teeming with marine life. Situated on Malaysia's northern tip, Langkawi is actually an archipelago made of 99 islands however most are uninhabited and the largest and main island, Pula Langkawi is where tourists go. Langkawi is home to a number of natural and historical attractions including the Black Sand Beach and Langkawi Cable Car. Located on the northwest coast of the Malaysia peninsula, Penang is both a nearby island in the Strait of Malacca and a state of Malaysia. George Town is the capital of Penang and is another major tourist attraction home to the remains of Malaysia's former colonial days including houses that said to be more than 100 years old. A picturesque destination, Penang is home to a wonderful range of shopping, dining and architectural attractions. Located in east Malaysia off the northwest coast of Borneo, Kota Kinabalu is the capital of Sabah and offers beautiful landscapes and National Parks facing the South China Sea. Named after Mount Kinabalu, which stands proudly on the island's east side, Kota Kinabalu is home to the underwater wonder of the Tunku Abdul Rahman Marine National Park located in the west. Enjoying beautiful beaches, spectacular scenery, excellent fishing and a host of natural attractions, Kota Kinabalu is also home to the Kinabalu National Park located 90km from the city centre and well worth a look.